Remember last week's shiny Pantone magnet project? I'm on a shiny kick right now and decided to test another type of glaze. Hopefully the repetition isn't so dull that your eyes... ugh, it's too cheesy; I can't finish the sentence. I like both products a lot and am making plans to glaze everything in my house. Ooooh. It is magic! I like very much. Thank you for sharing. This is so much easier than mixing up other chemicals. Maybe you could kind of roll the bottle between your palms to avoid bubbles... Someone once told me to do that with nailpolish, rather than shake it, and it seems to work well. Not that I could see any bubbles, but it might help you avoid them all together. It looks great, love the maps! I love those teeny-tiny maps! Too cute! Oooo! I love these! We have a thing for maps at this house. Thank you for testing both products for us, I had wondered. I think they are pretty magical! You must remember magic creatures don't come out when you are looking, only when your back is turned. Who knows what kind of critters you have running around. Try using a needle and popping the bubbles while the product is still wet. Loves these too! I still want to find some pantone chips. Thanks for sharing! Thanks for this cute idea!! when you have finished glazing all items at your home, please come to mine. I would love to do this with my husbands handy man biz card - he has an adorable logo that would be an awesome leave behind magnet!! So...which shiny glaze do you like best? I LOVE using the map...recycling! My sister gave us a gift wrapped in an old map, I may have to reuse it to make some magnets like these!!! WHAAAAT, MAGIC MOD PODGE?? This is blowing my mind right now. These look fantastic! Thanks for sharing, I was wondering about that stuff. that looks great! i've been meaning to make my own thumbtacks for a cork board... great tips! My favorite is Diamond Glaze. I have been using for these types of projects for over five years now and I love. It comes in an easy to use applicator. Don't shake it though. Just open the tip and pour it on. Thanks for sharing your projects! Hahaha sorry... Got stuck on the idea of a glossy house... Easily cleanable anyway! I think I'm going to have to investigate these varnishes further, I has no idea they existed... Thanks! Jess I'm glazing everything in my house too thank to you! I can't help myself! There should be a help group for this don't you think LOL! 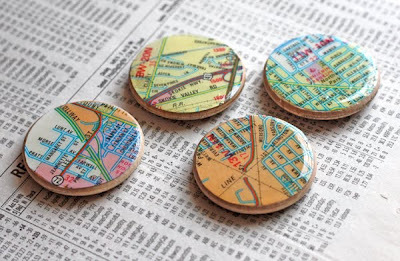 sucha cool idea...now i'll think twice before throwing out any old maps! Thinking back to decoupage days as a kid, you can blow lightly on the surface and the tiny bubbles go away. What a great idea. I love this. So simple, yet fabulous! Wanted to get your opinion on something- I've got a giant art piece that I want to cover in this stuff (the varnish glaze that requires a blow torch seems too much for me). Do you think I could cover it in this mod podge (if I buy lots)? It's 2 ft by 4 ft piece of wood, basically. Ha!! I used some high gloss stuff on a few sea shells last summer...next thing I knew I'd glazed every shell I've ever collected and had them in bowls EVERYWHERE!!! love new products...this looks like a fun one to play with! Cassie, it's addicting, isn't it? :) Ashley, I would think yes, but I'm not sure what the long-term effect would be... whether any of the ingredients in the stuff would cause the art to yellow or fade. And you'd need a ton of it. But I know who you should ask: Amy at Mod Podge Rocks. Her email address is in her profile. She's an expert on all things Mod Podge. Yay! I forgot to tell you that there are ground up unicorn butts and leprechaun legs in Dimensional Magic. So it kinda IS magic! One tip: don't shake the bottle, just turn it over and lightly tap it. Ashley, you could do that, but it would be expensive. There's also no UV protection so you should probably spray the artwork with a UV spray before the coating. Good luck! 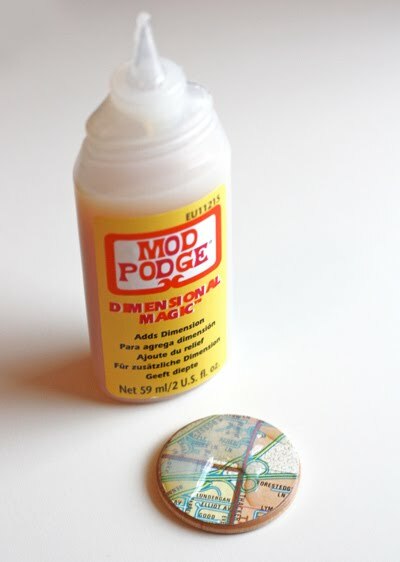 I've used Mod Podge before but haven't tried the dimensional one yet. I love the look! I love this idea - I'm looking at everything with new eyes to see if it would look good glazed! I'm curious where it says to shake it, because I've used Dimensional Magic and could swear I saw somewhere NOT to shake it, because it would form bubbles. I think it may have been on Plaid's website, but the link isn't working because the site is being redesigned, apparently. But no, don't shake it. Hold it at about a 45-degree angle and just pour slowly and smoothly. With practice, no bubbles, but you can use a pin to pop any that show up. Hi Amy. The very first two words on the label on the back of my bottle—in bold italics—are "Shake gently." awesome! i love shiny. will this stuff have a bit of stickiness to it or will i need to coat it with some kind of waterproof layer (if i was to use it for a table top)? Jess, I think Mod Podge is messing with us, because I went to check my bottle, and the very first words on the back of mine are "DO NOT SHAKE (causes bubbles)." With the capital letters and everything. Wonder what's up with the difference? Older vs newer packaging, maybe? Stephanie, it's not sticky, but I haven't tested to see if it's waterproof. There's probably something better --and way cheaper-- you can use for a table. Check out your local hardware store. A friend once poured some liquid stuff all over her little table and it came out like glass. Nifty, but I don't know what it was. Definitely something in a can, not a tiny bottle, though. I see a lot of backgammon sets in thrift stores, but they are often missing pieces. I think you've solved my dilemma. The next time I see an attractive leather board, I'll buy it. Then I'll make a fun set of pieces. I like the map idea. Maybe I'll use an old map for the "browns" and white for the other. I need to hodge podge the tops to make them shiny. I'll have to think about what I'll put on the bottoms to make them smooth like plastic chips would be. Thanks for solving my "problem!" This looks great --went out and bought Demensional Magic today. Thanks! You seriously c-r-a-c-k me up! Another product to try in your glazing ambitions - Diamond Glaze (brand: Judi-Kins). It's "dimensional adhesive", so you can glaze something, but also include something like a small bead. It is also mixable, so you can color it. Thus making orange "faux enamel". I've used the Dimensional Magic and had problems with air bubbles. The way I did away with them is to let the D.M. drop onto the project instead of putting the tip right on the project and then squeezing. Uhm, I use Mod Podge Dimensional Magic and it clearly states "DO NOT SHAKE," and then warns that shaking will cause bubbles! This product does not create bubbles if used correctly - you are giving this product a bad name. Next time, read the directions and if you mess up your project it was probably your fault. Hi Anonymous, I think the packaging must have been changed at some point, since the very first two words on the label on the back of my bottle—in bold italics—are "Shake gently." Thank you and the other commenters for verifying the updated instructions.